The term sustainability is a muddy one, covered in marketing efforts and political baggage. So when someone says they study sustainability or are part of the field of sustainability science, what does that mean? The discipline actually refers to a fairly well-defined subject borne out of the call for interdisciplinary research, especially between ecology and the social sciences. At its heart, the field is based in the need to provide food, fuel, and fiber to current and future residents of planet earth. In other words, it’s the science behind the Brundtland Commission’s oft-cited goals of sustainable development and hopes to understand and create long-term integrity of the biosphere and human well-being. As originally envisioned, the field is an applied science to provide the theory and tools to provide for the needs of humans and their environment for the future. As currently practiced, sustainability science focuses on new ways to conceptualize “ecosystem” with the humans that live in it and thus is largely comprised of the social sciences, as understanding of human behavior and governance is far behind our understanding of traditional ecology. But as knowledge in the social and natural sciences becomes more evenly matched and even paired for certain places or ecosystem types, the balance will likely swing back more toward the center. The origins of the field are rooted in a desire to make the word “sustainable” more analytic and concrete, part of the Sustainable Biosphere Initiative. The SBI was started by leadership of the Ecological Society of America (ESA) and summarized in a call to action published in Ecology. This movement is echoed in recent activity by ESA in their year of Earth Stewardship. The idea here is an integrated science of humans and nature that will serve the future needs of both. Sustainability science, as made official by the National Research Council, brings together the work of ecologists embodied in the SBI and now Earth Stewardship with existing strains of academic thought from engineering (how do we do it), geographers/anthropologists (how are nature and culture connected), and especially the development community with growing needs on a global scale. A great summary article in PNAS sets out the research agenda for the field, which has been fruitful in the ensuing decade. So where does this leave us today? The field is slowly structuring itself and listings for “professor of sustainability science” are cropping up all over the country. Although “Sustainability Science 101” does not yet grace the average college course catalog, Robert Kates just released his Readings in Sustainability Science for those of us who want to catch up or create such a class. In his introduction, Kates states “the distinctive knowledge created by sustainability science is use-inspired and, at its best, provides solutions to real-world, often place-based, problems encountered for the needs of a sustainability transition”. It’s one of the best definition’s I’ve seen thus far for what sustainability science has to offer. 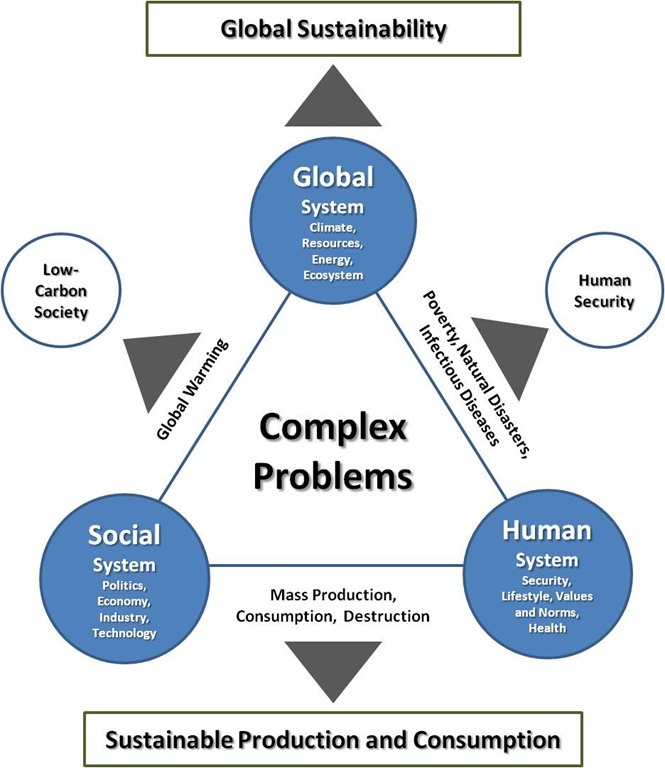 Sustainability Science probes interactions between global, social, and human systems, the complex mechanisms that lead to degradation of these systems, and concomitant risks to human well-being. The journal provides a platform for building sustainability science as a new academic discipline which can point the way to a sustainable global society by facing challenges that existing disciplines have not addressed. These include endeavors to simultaneously understand phenomena and solve problems, uncertainty and application of the precautionary principle, the co-evolution of knowledge and recognition of problems, and trade-offs between global and local problem solving. PNAS has launched a new section of the journal dedicated to sustainability science, an emerging field of research dealing with the interactions between natural and social systems, and with how those interactions affect the challenge of sustainability: meeting the needs of present and future generations while substantially reducing poverty and conserving the planet’s life support systems. How can thosedynamic interactions be better incorporated into emerging models and conceptualizations that integrate the Earth system, social development, and sustainability? How are long-term trends in environment and development reshaping nature–society interactions? What factors determine the limits of resilience and sources of vulnerability for such interactive systems? What systems of incentive structures can most effectivelyimprove social capacity to guide interactions between nature and society towardmore sustainable trajectories? How can science and technology be more effectively harnessed to address sustainability goals? Stay tuned for the answers and the science-informed policy that results. This post is a life saver. I’m a college student and sadly have not been aware of sustainability (have heard of the word but had no idea what it has meant). All green intiatives in my point of view have been fashionable or a supposed political scheme. Now I see understand it’s for “current and future residents of planet earth.” Light bulb moment here 🙂 I’m going to be a highschool teacher so my students will be more aware of sustainability and the true importance of it than I have been! Thanks!